Alright decided that I would just start a new thread possible build on the new Jeep. Depending on how long it sticks around this build could go on and on but don't get your hopes up yet. 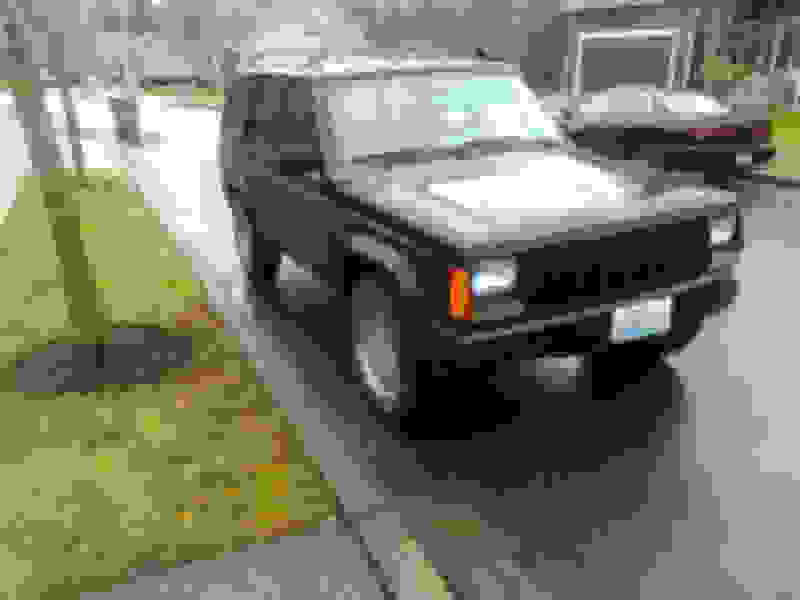 Last week most of you know I got the Jeep (1995 HO 4.0) and it was cheap but not free! Hence the title and we all know stories like that. So day one drove it home well PO did. Next day I discovered power steering pressure hose leading into power steering box was shot. Damn near caught jeep on fire when I was testing for leaks. Since then, I have fixed the hose and as good as new. Second or third day I decided it was time to tear off front bumper and put on a donor front clip. Previous one was mangled along with the bumper and partial fender but the fender staying for now. Next thing well it was ongoing when I got it. Previous owner had to start the beast with a wire jumping the relay box under the hood. Figured maybe ignition tumbler was bad so I went about it. Yesterday I found a extra relay in jeep popped it in thinking it wasn't going to work and varoom. She started right up took her to get gas all good. This brings me to this morning, I woke up started just fine let her sit a moment put it in drive slowly started out driveway and she died. Tried to restart only find out no start, no clicking, no nothing when I tried to turn key to start position. Put it in park, tried a couple more times nothing. So I figured what the heck grab pliers pull relay and jump it with that little wire again in the relay box and she started and ran fine all the way to work. So any thoughts? Would like to sort out this starter relay asap and of course turn signals before I get a ticket or I'll just have to hold off on driving it right now. Couple photos but nothing you guys haven't already seen. No name for her yet but perhaps later. Last edited by XJIrish4x4; 04-09-2018 at 10:05 AM. I have no real plans yet to put a ton of money into her I'm probably just going to put some basic brand new tires on her this week so I can continue to drive it. I wouldn't mind a mild lift but I need to wait I think. I was thinking a 2-3" lift and run some 31's but I don't have much time on these existing tires and order the lift. Yea you got some wiring gremlins too? I hate these issues I even have enough electrical issues with my '89 with tail lights and blinkers not working. Now I sorta have the same issue with this one. I would like to sort out the starting issue more than the turn signal issue. That part is drivign me nuts! Well. I am assuming the worst...Door lock and widow controls are hanging loose. Previous owners husband was one to start things and not finish.. So I didn't switch over internally I just swapped doors all together. My power windws on my '89 did not work. So I just got two doors from another member on here. He lives locally to me and he was parting his daughters old Jeep out so I picked them. Here is a question for you guys pertains to my '89 really but if a door is shut and will not open even if you move unlock switch, etc can you still pop off door panel to fix what is broken inside? It is my drivers side rear door but when door is closed can I even access to remove panel? It used to open and then stopped one day and I could never get it back open. You should be able to pop off the panel and open it with one of the rods no problem with the door shut, you might have to take the rear seat out to get better clearance. Sounds like a rod or something popped off, or a piece broke inside. Not sure on the older models but i've taken mine apart plenty of times and have easy access to everything. One day i'll own more than one XJ... It seems like so much fun! Not so much on the wallet, however. Good luck with this one i'm excited to see progress big or small! Thanks for that information. Funny thing is I have not tried yet just always appeared to be something that I could not do. I believe your assumption to be correct I mean it worked when I first got it then one day I tried to lock door and that was that. Although it is a lot of fun having more than one XJ, when you get tired of one you just go to the other. At the same time I find myself still trying to decide if one is going to stay or go. With my life right now moving around for Military duties I can't imagine 2 XJ's are going to stay, we have 2 perfectly good vehicles. I could keep one toy and that is probably about that. If my son was just about 2 years older I could convince my wife to keep both and give one to him to drive and help build for him. Last edited by XJIrish4x4; 04-10-2018 at 07:51 AM. 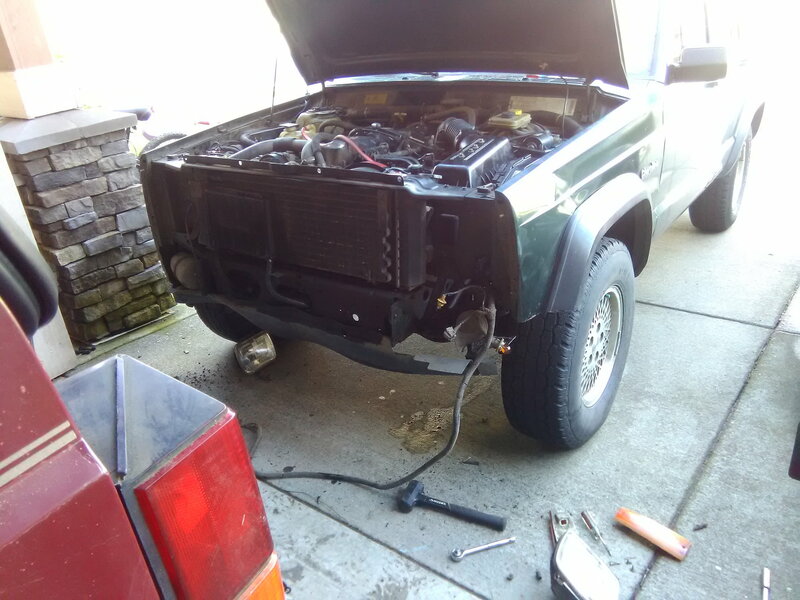 So today I got home early to work on jeeps. I wanted to swap rear hatch I had on the '95 which was red for a dark blue one. Everything was alright up to the point that I realized wiring did not match so I just put red one back on. Plus I couldn't get it to seat right on roof to give a good seal. When I was going in for the night I decided why not check lights. I now have tail lights, running lights and even turn signals all around. For the love of god I hat electrical issues lol so either I did something during hatch removal that fixed my lights or its intermittent issue. Any ways its working now hopefully for good. Fixed Heater today and she got some new sneakers. I wanted 31s but they not going to fit on stock wheels I don't think and with no lift. I have 30 days or 1000 mile to decide if I like them or I can return for full cost of tires minus labor. So maybe I'll get a 3" kit on it and change to 31s. Sorry guys my computer and phone were having issues posting photos. I managed to get photos up of the tire carrier bumper setup for my red jeep last night but couldn't get one of tires. I don't think anyone really cares they are stock tires anyhow. Well turns out today I made a phone call to shop who installed my tires. I told them I'm not happy with the stock and I want 31's but same style. (Good thing for the 1000 mile 30 days not happy refund lol) They just never done this before so I'm going to be the first person to take them up on that offer and they need to contact Falken and see how it works. Yea dummy me I should have gone with my instincts from the get go and got the 31's but I was in pinch needed to drive Jeep and I didn't have (4) 15X8 wheels to mount them on. I don't know if they would have fit stock wheels but I also need to trim up the fenders some I believe to run 31's stock height. I do plan to go with 3" kit in the near future but for now I'm going to run a LCOG on new wheels. I should be picking up 3 wheels this week to match the extra wheel I already had sitting around. Then the shop is going to call me Wednesday and factor in difference in price to 31's plus mount/balance. Hopefully by the time I get my price from the shop the wheels will be ready for pickup from 4wheel shop. I would have had them shipped to the house but I work near the 4wheel shop so might as well just pick them up there. I think once all said and done this Jeep will look really nice sitting on 31's and even if I sell it will help with the resale value. I'm attached to it for my daily purposes so who knows what will happen in the next few months to a year or so. Waiting on the shop to contact me and my 3 new wheels to come in will allow me time to remove fender flares and do the cut and fold on fenders. Front bumper already missing in action so that eliminates that problem. Rear bumper shouldn't be an issue but I would likely need to cut and fold rear quarter fender. I got a buddy who is grabbing a long arm kit and running a 3" lift on his Jeep now so I'm probably going to get his 3" when he upgrades and install it on this one. Last edited by XJIrish4x4; 04-15-2018 at 06:48 PM.